Information literacy skills are something teacher librarians deliver in depth; providing expertise, resources, research, and collaboration to ensure this happens for students throughout our country. We need to make certain students become information literate. More importantly, we must instill the desire to care about distinguishing between what is accurate and reliable information and what is not. 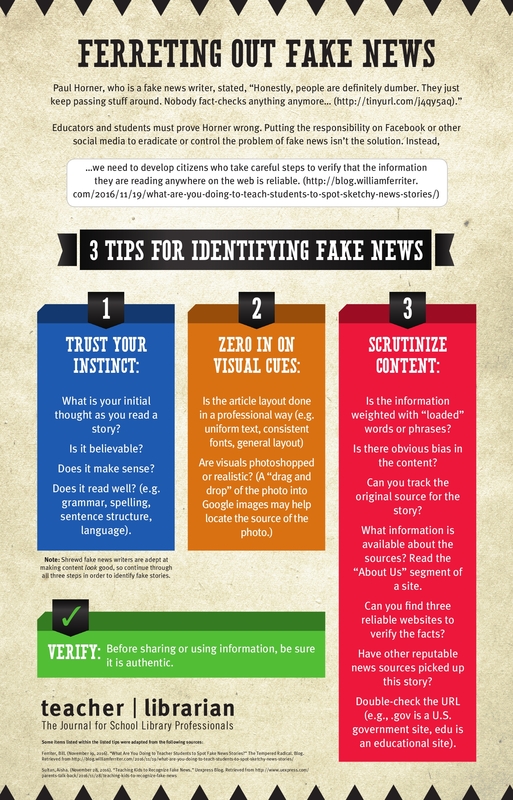 To that end, the editors of Teacher Librarian created the poster Ferreting Out Fake News as a quick guide and reminder for students (and others) who need to learn how to identify fake news. Please feel free to download a copy for your library and classroom, and to share with others. Click here to download a hi-res PDF copy of the poster.